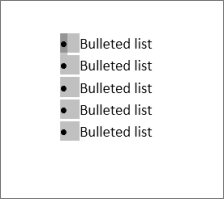 Select the bullets in the list by clicking a bullet. The text won’t appear selected. Right-click, and then click Adjust List Indents. 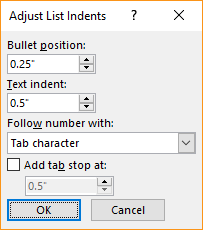 Change the distance of the bullet indent from the margin by clicking the arrows in the Bullet position box, or change the distance between the bullet and the text by clicking the arrows in the Text indent box. In the Follow number with drop-down box, select from Tab character, Space, or Nothing. Finish making your adjustments, and then click OK.
Click next to the text for the bullet you want to change. On the Home tab, in the Paragraph group, select the arrow next to Multilevel List, and then select Change List Level. Select the level where you want the bullet. Each level has a different bullet style. If you’ve created a document in the Word desktop client, Word Online will preserve everything you’ve done, including your bullet alignment. Unfortunately, while you can change the indent of your bullets, you can’t fine-tune the alignment of your bullets in Word Online. If you already own the desktop version of Word, you can use it to fine-tune the alignment of your bullets. If not, you can try or buy the latest version of Office now. Got a suggestion for this feature?